John 1:29-34 The next day John saw Jesus coming toward him, and said, "Behold! The Lamb of God who takes away the sin of the world! "This is He of whom I said, 'After me comes a Man who is preferred before me, for He was before me.' "I did not know Him; but that He should be revealed to Israel, therefore I came baptizing with water." And John bore witness, saying, "I saw the Spirit descending from heaven like a dove, and He remained upon Him. "I did not know Him, but He who sent me to baptize with water said to me, 'Upon whom you see the Spirit descending, and remaining on Him, this is He who baptizes with the Holy Spirit.' "And I have seen and testified that this is the Son of God." 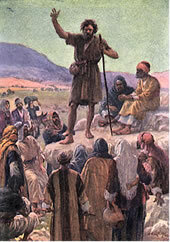 John the Baptist was a preacher who spoke about repentance and salvation and who also baptized people for repentance. Once when he was preaching, he saw Jesus coming towards him. As a result, John the Baptist said that He (Jesus) is the one who he had been talking about, and that Jesus is far greater than himself (John 1:15). God used John the Baptist to prepare the way of the Lord. That is exactly what we do today: We prepare the people for the Coming of the Lord!